Join Likud Anglos for an evening with Member of Knesset Danny Danon. The Deputy Knesset Speaker, Chairman of the Immigration, Absorption and Diaspora Affairs Committee and of World Likud will give a short address on the dire issues facing Israel, and then take your questions. Date: February 22, 2011, 7:30 p.m. 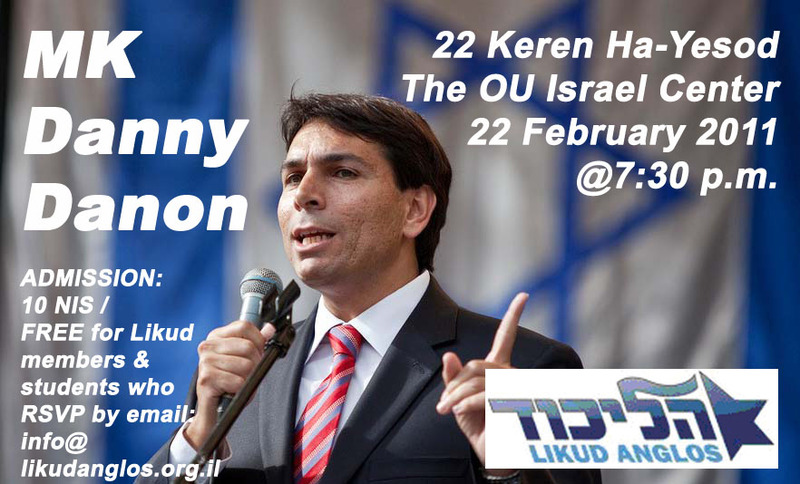 Admission: 10 NIS (to cover costs of venue & refreshments), FREE for Likud Members and Students who RSVP. For more information on MK Danny Danon visit www.dannydannon.com.